Jessica Long is a Managing Director with Accenture and has 20 years of national and international experience in strategy, technology and complex program delivery within the corporate, government and international development sectors. Jessica is on the global leadership team of Accenture Strategy & Sustainability, which helps organizations leverage their assets and capabilities to drive innovation and profitable growth while striving for a positive economic, environmental and social impact. Within her current role, Jessica leads the Sustainability & Trust practice across North America, and is the group’s Global Responsible Business Lead. 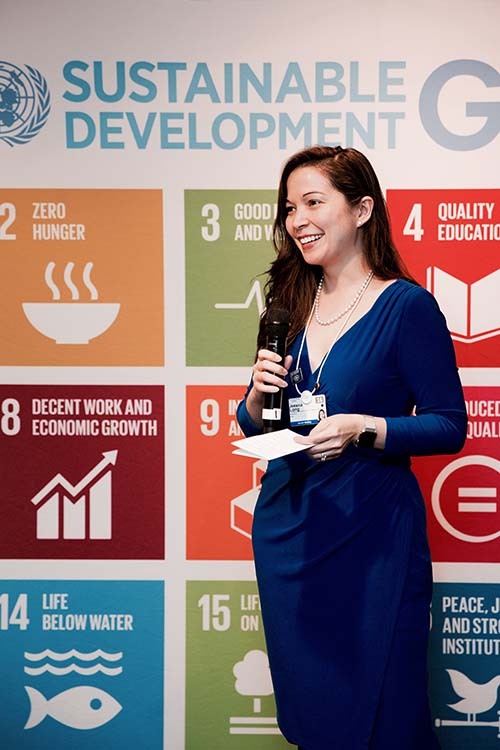 Her team focuses on a wide range of strategic services across sustainability – including circular economy, valuation and performance management, responsible business, ethical and responsible supply chains, traceability and transparency, intelligent cities strategy, efficient and alternative energy solutions, innovative business models and partnerships, trust and digital responsibility. Clients include Fortune 500 companies, SMEs, governments and non-profit organizations. Jessica was previously on the global leadership team of Accenture Development Partnerships (ADP), a group within Accenture which provides business and technology services to the international development sector. She led ADP’s suite of solutions across Program Innovation & Impact, Partnership Services and Organizational Strengthening & Enablement and led the group’s portfolio across Africa (based in Nairobi) and the Americas. She has led transformation and development projects for corporations, international NGOs, governments and multi-national donors, with a focus on innovation, technology & growth strategy, economic development, shared value and collaborative partnerships. Previously, Jessica was a consultant in Accenture’s Strategy practice, leading transformation engagements with large governments and corporations. Before joining Accenture in 2001, Jessica worked in the United States Senate. Within the last several years, Jessica has lived and worked in several countries across North America, South America, Africa and Europe. Jessica is a regular contributor to the World Economic Forum, Fortune and Huffington Post, holds a patent and has received several awards while working with Accenture, including the Inspiring Leader Award, Innovation Award and Inventor’s Award. She speaks regularly at local and global conferences on the topics of technology-enabled transformation, sustainable and purpose-driven business, cross-sector partnering and innovation for development. Jessica serves as an advisor to the Business & Sustainable Development Commission, the Global Community Engagement and Resilience Fund (GCERF), Rise the Global Business Commission for Education (GBC-Ed) and Raise DC. She has been honored by the World Economic Forum as a Young Global Leader. Teachers open our minds to the world of possibilities around us. More importantly, they demonstrate how each of us can contribute to making the world a better, more equitable place.